Macon, D.K, R.A. Baldwin, D.F. Lile, J. Stackhouse, C.K. Rivers, T. Saitone, T.K. Schohr, L.K. Snell, J. Harper, R. Ingram, K. Rodrigues, L. Macaulay, and L.M. Roche. IN PRESS. Livestock protection tools for California ranchers. Oakland: University of California Division of Agriculture and Natural Resources Publication 8598 (in press). Sometimes, simply being in the right place at the right time can prevent depredation on livestock. Human presence, which can include hazing and other fright tactics, can modify carnivore hunting patterns and dietary preferences (Bangs et al. 2006). Many large-scale sheep operations in California use herders to manage their day-to-day operations - these herders can be a predator deterrent. Individual ranchers, rancher associations, or nonprofit organizations may employ range riders. Range riders have mostly been used in areas with potential wolf-livestock conflicts, often with the specific task of disrupting predatory behavior. It has also been suggested that low-stress stockmanship techniques can re-instill herd instinct in cattle. While there is little empirical evidence regarding effectiveness of range riders, herders, or stockmanship techniques, ranchers perceive the benefits of range rider programs to include depredation mitigation, increased management and information on livestock, rapid carcass identification, and a variety of social benefits (including reduced stress, reduced trespass and littering, improved public perception, and trust building). 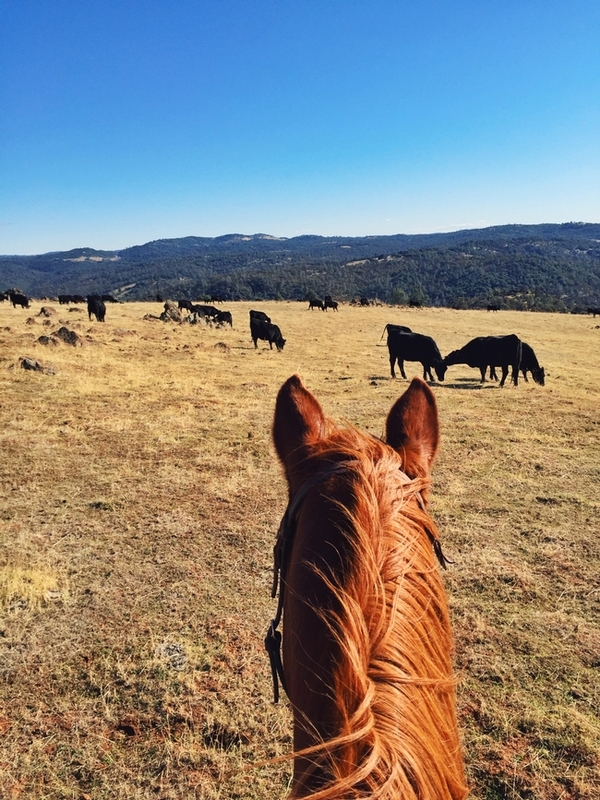 Range riders can also provide additional tools beyond simply being present on the landscape, including carcass removal, treatment of injured or sick animals, and stockmanship (Parks 2015). On the other hand, wolves, especially, may become habituated to seeing humans, avoiding areas where they see humans during daylight hours and returning at night (Parks 2015; Williams personal communication 2016). Varying the pattern of human presence appears to be critical to preventing habituation. Finally, range rider programs may be cost-prohibitive in the long term. Most existing range rider programs are funded through combination of grant funding (from nonprofit organizations and/or government agencies) and in-kind contributions from ranchers (e.g., housing, horses or ATVs, investment of time, etc.). Ranchers who have participated in range rider programs in the northern Rocky Mountains perceive the costs to outweigh the benefits (Parks and Messmer 2016). If you're interested in learning more about the nuts-and-bolts of range riding as a predator protection technique, Defenders of Wildlife is offering a 2-day range rider school near Chester, CA on February 20-21. Contact me at dmacon@ucanr.edu if you'd like more information. Obviously, the tools I've described in this series of blog posts fit some situations better than others. Predator behavior, like livestock and human behavior, is dynamic. Predators can become habituated to some tools; as producers, we have to adapt our strategies to these changing conditions. For example, we've used llamas to protect small groups of sheep at our home place. Eventually, the coyotes learned that our particular llama wasn't a threat - and we lost a ram. Our adaptation at home was to night pen the sheep. 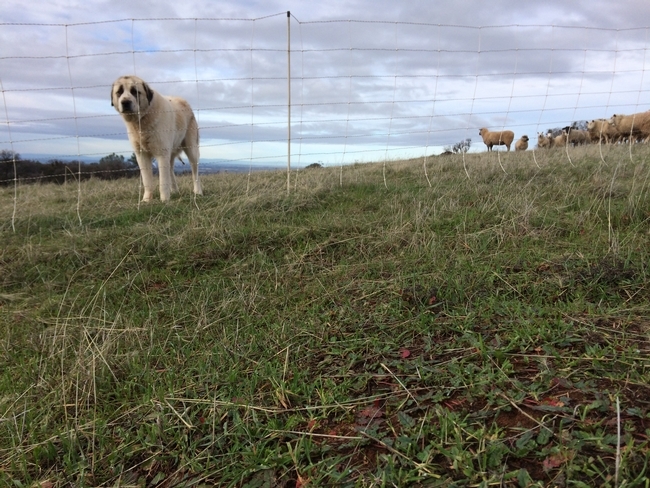 On the other hand, our particular combination of livestock guardian dogs and electric fence on our leased pastures has been highly effective. For more information, be sure to check out the Livestock-Predator Info Hub at http://rangelands.ucdavis.edu/predator-hub/. And please share your experiences in protecting your livestock! Late last month, I participated in a workshop on livestock-wildlife co-existence at the UC Hopland Research and Extension Center. As I prepared for "demonstrating" livestock guardian dogs (LGDs), I struggled with how to show people what LGDs actually do. Whenever I host people at our own ranch, the dogs come to the fence to greet us, sniff the strangers (and occasionally bark at them), and lay down - not a terribly dynamic demonstration. While I've written extensively about my experience with LGDs on my personal blog (www.flyingmule.blogspot.com), the scientific literature regarding these dogs, their training, and their behavior, is rather slim. The four-hour drive home from Hopland provided ample time to think about opportunities for demonstrating LGD behavior and efficacy. Demonstrating these attributes is equally difficult, though for different reasons. Measuring the efficacy of LGDs (or any nonlethal tool) is challenging because we can't measure what doesn't happen. I have no way of knowing how many lambs were not killed by predators because of a specific tool. Furthermore, my situation (in terms of habitat, sheep behavior, dog behavior and predator behavior) may be very different than my neighbor's. Similarly, demonstrating behavior is difficult in any kind of real-world setting. Watching a dog napping at midday is not very interesting for most of us. In the 12 years we've used LGDs in our sheep operation, I've never observed any direct interaction with a predator. In light of these difficulties, I've started forming a plan for obtaining information that will help producers (and others) understand how LGDs work in different environments, as well as the economic and management considerations involved in using LGDs. With help from colleagues at UC Davis, UC Cooperative Extension, and other universities, I'm building GPS collars that will allow us to record LGD and sheep movement remotely. We'll also use game cameras to see if we can detect predator (or other wildlife) presence in the vicinity of the dogs. After I test these systems in our own sheep enterprise, I intend to work with other producers representing a variety of environments and management systems. My hope is that we'll be able to observe these dogs at work, as well as their interactions with sheep, using GPS in a variety of settings. The second element of this project will provide a case study in the development and use of a specific dog. Earlier this week, I acquired an eleven-week-old male Pyrenees x Akbash puppy from Dr. Fred Groverman, a sheep producer in Petaluma. 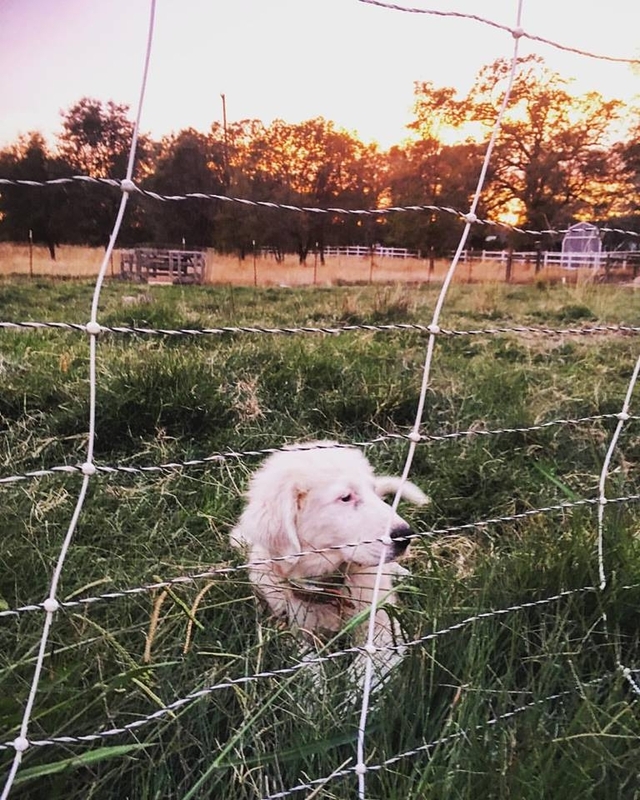 While Elko (as we've named him) will eventually go to work in our flock, I will document the training, management and expense involved in purchasing, developing and deploying a LGD pup. My intent with this part of the project is to regularly post information about Elko's development (both successes and challenges). I'll also post short videos on a regular basis to document his development and behavior. As these efforts develop, I would appreciate input and questions from producers throughout the state! Do my observations and experiences match yours? Are there other approaches to developing a LGD that have worked (or haven't worked) for you? Are there other questions we should be asking ourselves? 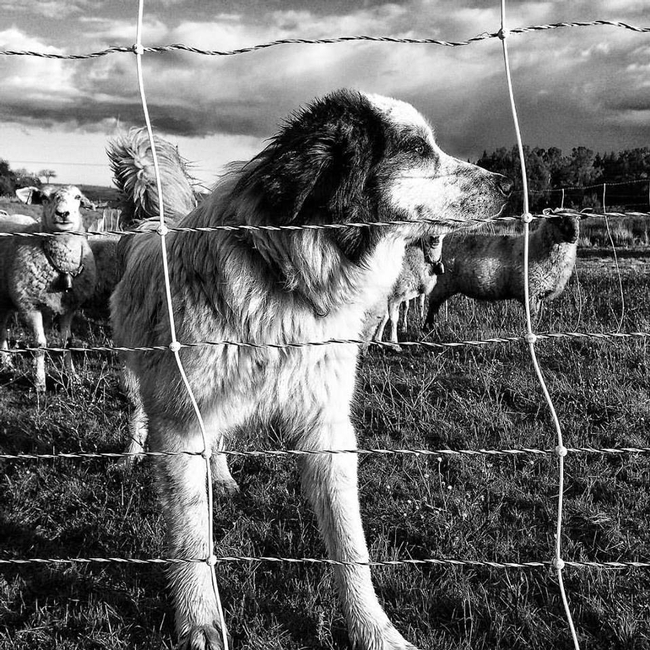 Many of us refer to LGDs as livestock protection "tools." As biological (rather than mechanical) tools, however, using a LGD effectively is much more complicated than using a hammer! I'm hopeful this project will help all of us gain a better understanding of how these dogs work!